Such a fantastic, fresh tasting pasta perfect for those long summer days. Stir in yogurt. 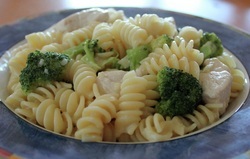 Add chicken, pasta, and broccoli. Heat until just warm.